These are lyrics by Allman Brothers Band that we think are kind of repetitive. 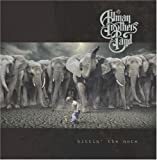 Allman Brothers Band's, "Ramblin' Man"
Near the end they start repeating this line over and over, until they finally give up and start repeating just the guitar riffs (with some very slight variations)... but the whole repeating bit is at least 2 minutes long. Sort of like 'Hey Jude'.